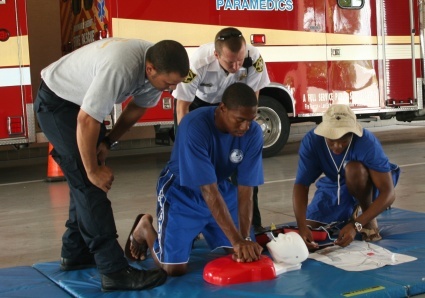 (Lauderdale Lakes, FL) – Lifeguard Michael Rolle (center) demonstrates the ease of bystander CPR while fellow Lifeguard Dawson Charles (far right) readies the Automated External Defibrillator (AED) at Broward Sheriff Fire Rescue Station #37 on Thursday. Giving pointers are Broward Sheriff Firefighter Cosme Jimenez (left) and BSO Deputy Bill Browning. United States Congress has proclaimed the first week of June as CPR/AED Awareness Week. The goal is to have more Americans trained in CPR and AED use. At minimum, at least one member of every household should learn it. The American Heart Association (AHA) has recently simplified CPR guidelines to make it easier for people to do the procedure. It’s called “Hands Only” CPR and eliminates the mouth-to-mouth component of earlier methods. While a recent survey shows that 89% of Americans asked were willing and able to help if they witnessed a medical emergency, yet few (12-20%) are confident that they would know when to do CPR or use and AED. Broward Sheriff Fire Rescue EMS Chief Stephen Krivjanik said, “By eliminating the mouth-to-mouth contact and simplifying the process, bystanders will be more willing to do CPR if someone suffers cardiac arrest.” On AED usage Krivjanik adds, “People should not be afraid to use them, they are very easy to use, fully automatic and talk you through the steps.” There are over 1,000 AEDs in Broward County facilities like schools, courts, parks and libraries plus many private establishments, like restaurants and stores have them. According to the AHA, about 310,000 coronary heart disease deaths occur out-of-hospital or in emergency departments in the United States. Of those deaths, about 166,200 are due to sudden cardiac arrest. That’s nearly 450 per day. Less than one-third of the cardiac arrest victims that occur outside the hospitals receive bystander CPR. The Broward Sheriff’s Office conducts CPR/AED training and also offers free, non-certified infant and child CPR instruction as part of our Childhood Drowning Prevention Program just introduced. For information on these programs and a schedule of CPR/AED classes, visit http://www.sheriff.org and click on the Drowning Prevention tab or call the Broward Sheriff Fire Marshal’s Bureau at 954-831-8210.